One of four Irish Terriers, the Kerry Blue Terrier was developed as an all-around farm dog that included guarding property and killing vermin such as rats and otters. Some were even trained to work as retrievers in the field. Today it is recognized as the National Breed of Ireland and is kept primarily as a companion. The Kerry Blue Terrier was first seen in the mountains of Kerry Ireland, giving name to the breed. Its ancestry is unknown, but local legend states that the breed descends from a shipwrecked dog swimming to shore in the Bay of Tralee. This dog was said to have bred with local terriers to create the line. Those accepting the legend as fact have often suggested this mystery dog as being a Portuguese Water Dog. Others have suggested they are the result of Irish Terriers (or Soft Coated Wheaten Terriers) crossed with Bedlingtons. 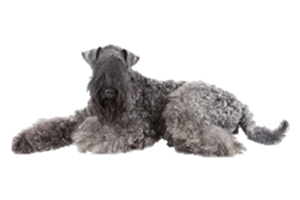 Today their numbers have declined so that the Kerry Blue Terrier is listed among the Kennel Club's Native Vulnerable Breeds. Is the Kerry Blue Terrier Right for You?